At InPrint Italy 2018, Xaar celebrated the commercial launch of its Xaar 5601 printhead. The company also showed their new High Laydown Technology. As InPrint 2018’s official conference partner, the company took part in a range of industry discussions over the three days. It took eight years to develop the Xaar 5601. This printhead gives high-resolution print at high speed, with more than 5600 nozzles the printhead is capable of jetting up to eight litres of fluid per hour. A growing number of OEMs are developing their print solutions based on the Xaar 5601, such as Windmöller & Hölscher, which was announced earlier this year. 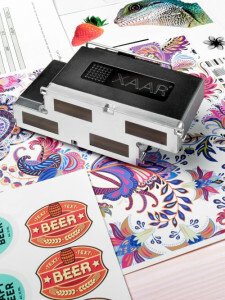 The Xaar 5601 can be used for a wide range of applications including packaging, textiles, décor and commercial print. During the show visitors could see the application of Xaar printheads for industrial print, packaging, advanced manufacturing and 3D printing. Visitors could also see the results reached with Xaar’s High Laydown (HL) Technology, enabling the printing of a range of textured effects on labels, folding cartons and other products. Such high-build, textured embellishments (also called tactile or dimensional effects) can be used to significantly enhance the shelf appeal of products and ensure they stand out on display. Throughout the show, Xaar took part in a range of industry discussions over the three days. Werner Zapka of Xaar hosted the Technical Conference on day one and day two and introduced talks from industry leaders, including two by Xaar engineers Renzo Trip and Tomas Cerny. Jason Remnant, Xaar’s Senior Product Manager, discussed ‘Keeping up with and getting ahead of the demands of packaging printing with the Xaar 5601’, and on day three, Angus Condie, Director of integration and applications, gave a talk on ‘Latest developments in using High Laydown Technology for 3D photopolymer printing’. Also on day three Mike Utley covered the conversion to inkjet in direct to object printing. Xaar’s partners were also present at InPrint Italy 2018 and showcased their products and technology. One of these, Meteor Inkjet Ltd launched its new DropWatcher family of products, designed to evaluate and optimise printhead and ink combinations.